I had to submit photos of my jewelry to a potential selling spot, so I shot a bunch of photos of newer items. I’m posting those photos here, along with some older photos too. If you see anything you like, let me know, and we’ll work out a price. 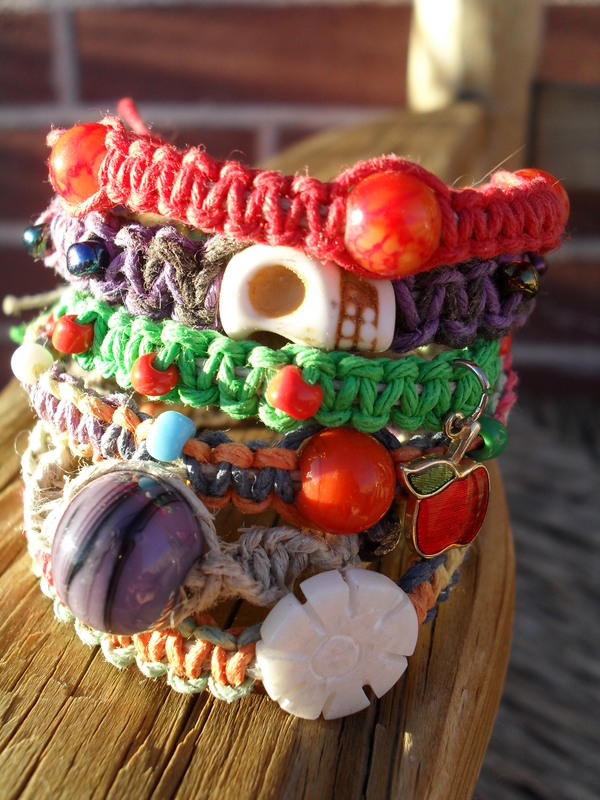 All of these bracelets and necklaces are handmade by me from hemp. I have no minions and no sweatshop. I do all this work myself. 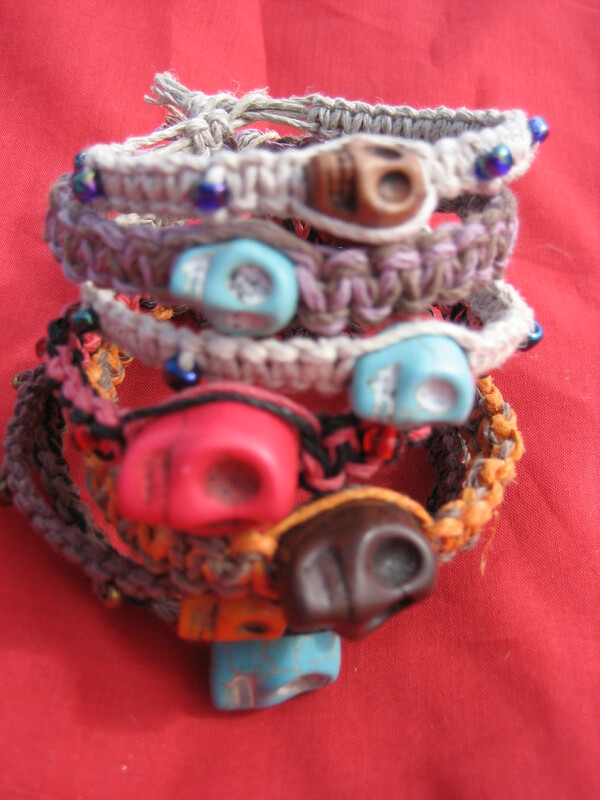 All of my bracelets and necklaces open up completely and fasten securely. 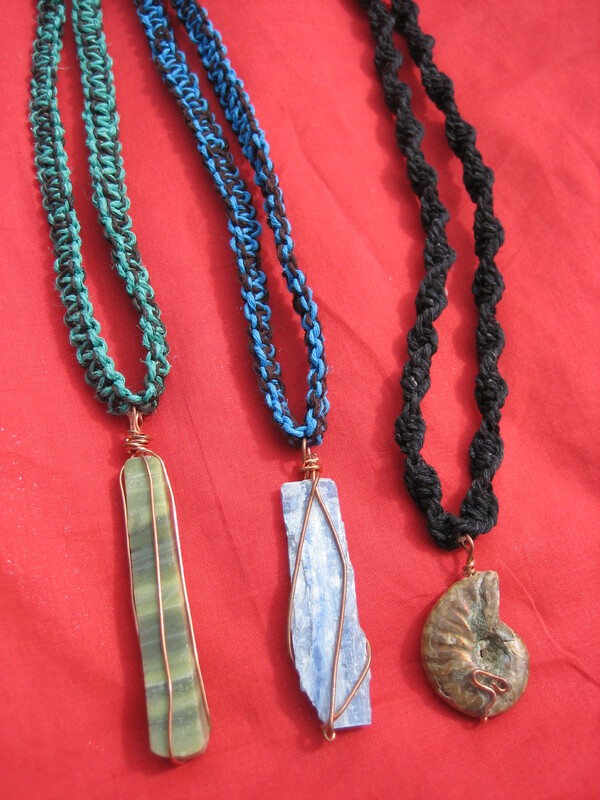 If you see a pendant you like, but you don’t care for the color of hemp that I’ve used, ask me and I may have a similar pendant that I can use with different colored hemp. 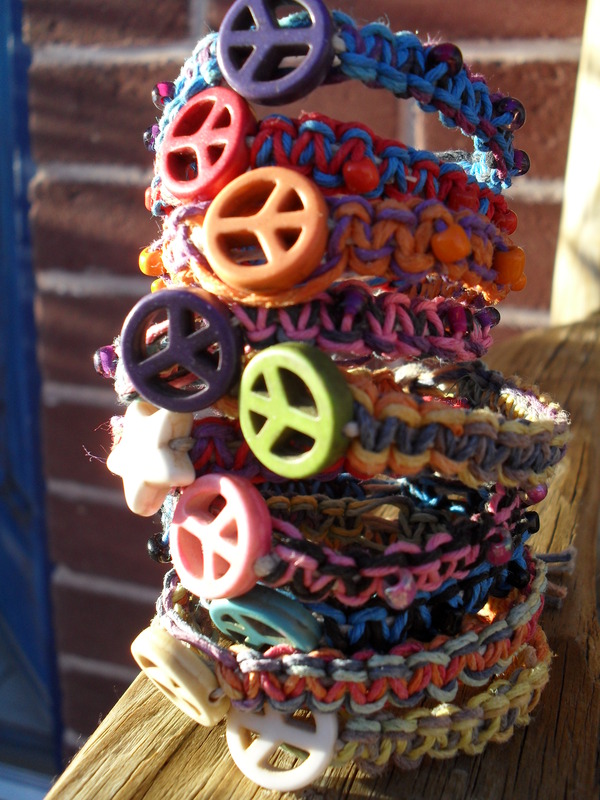 I also do custom work, if you have a pendant that you’d like for me to put on a hemp necklace for you. 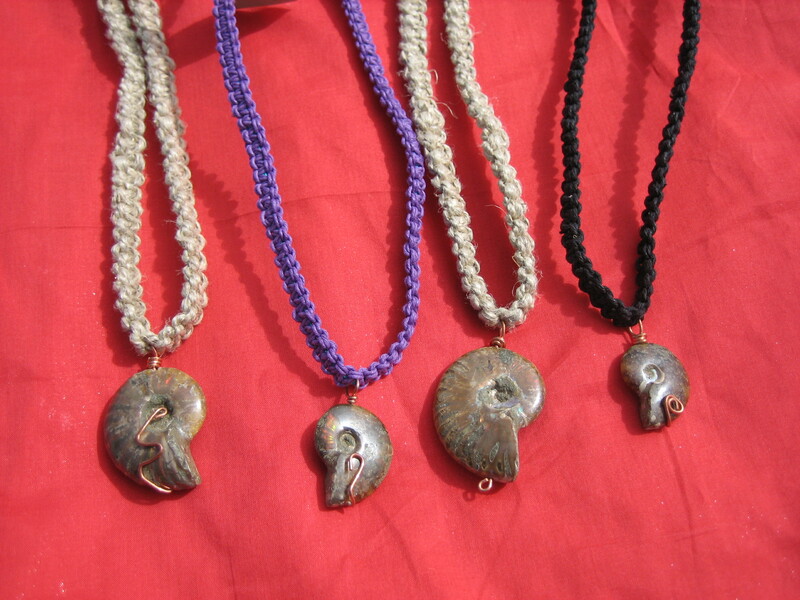 Ammonite necklaces. Ammonites are the fossilized remains of ancient sea creatures that died out about the same time as the dinosaurs. 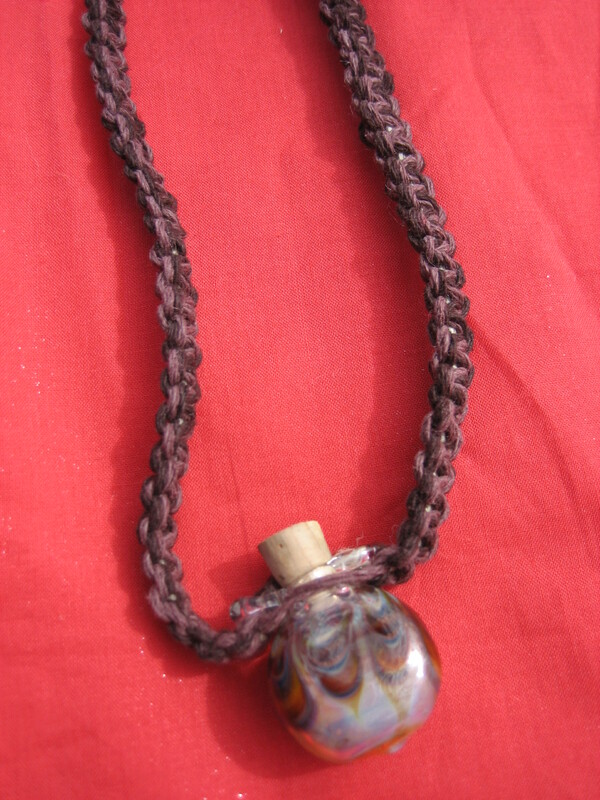 Glass bottle necklace. The stopper comes out so bottle can be filled with sand, soil, tiny beads or stones, a poem, or a love note. 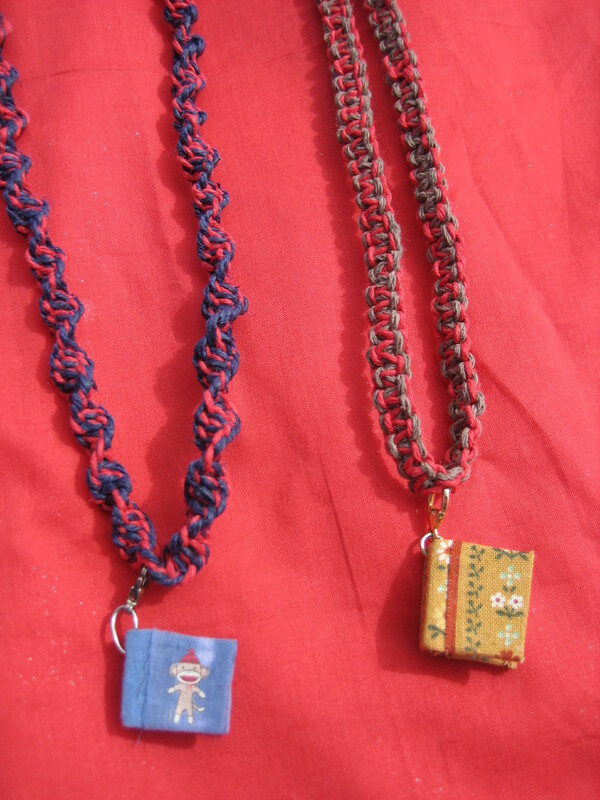 Necklaces with tiny book pendants. My sister made the tiny books. Both of them open up completely and have tiny pages which can be written upon. The blue book has a tiny sock monkey on it. 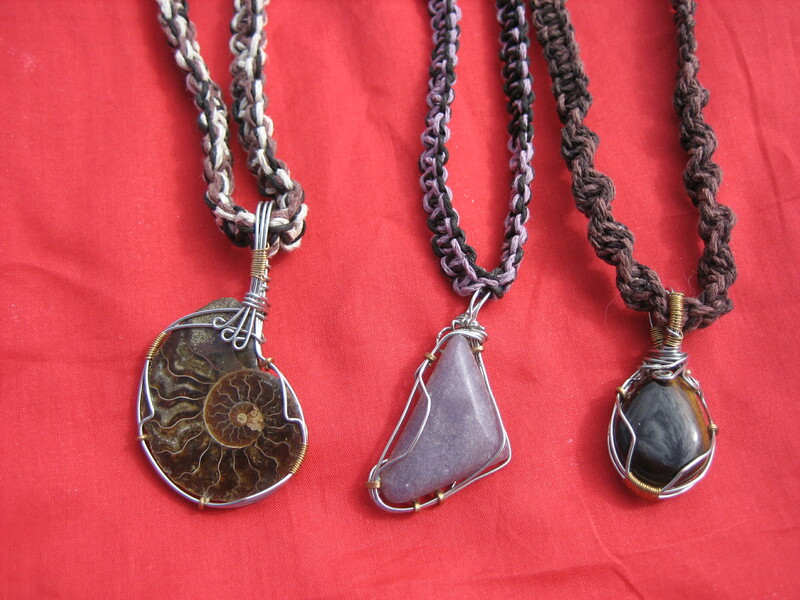 Ammonite, lepidolite, and tiger’s eye necklaces. 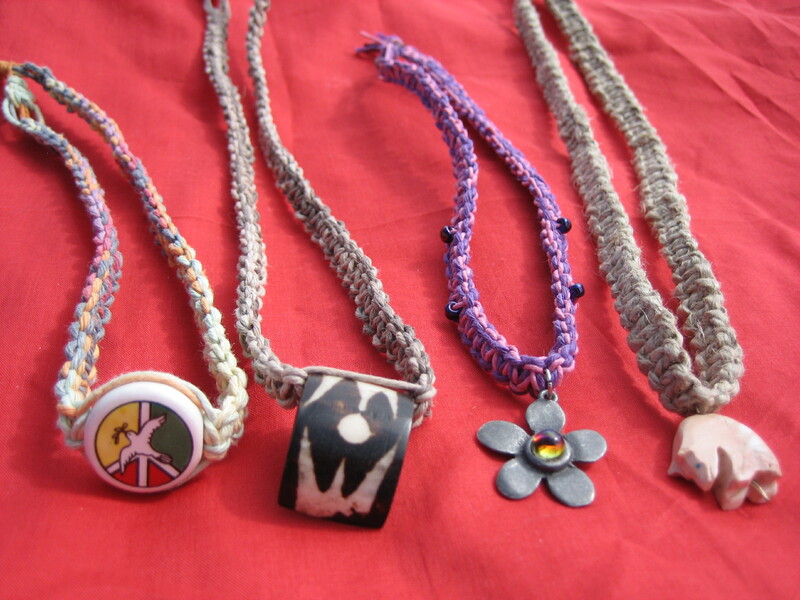 These pendants were wrapped by James Smith, a young artist out of Taos, NM . 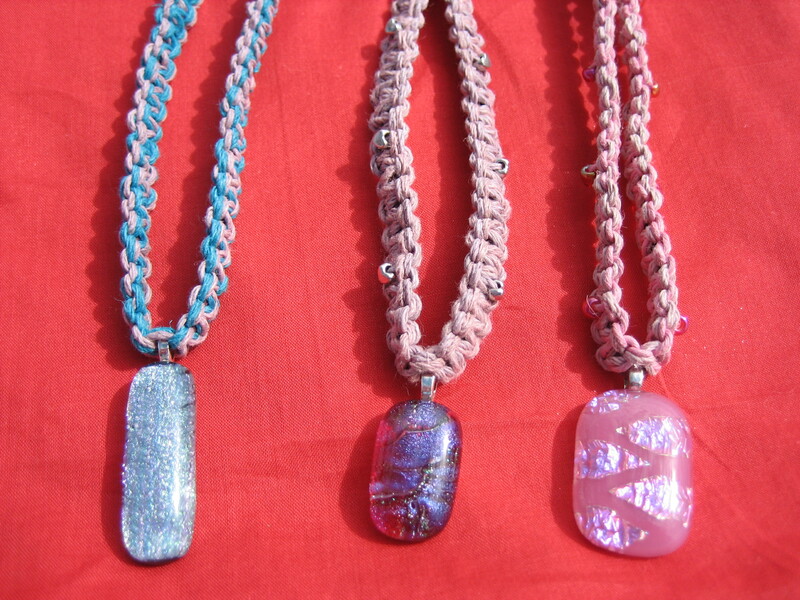 Necklaces with fused glass pendants. The fused glass pendants were made by Brenee Carvell of Tulsa, Oklahoma. 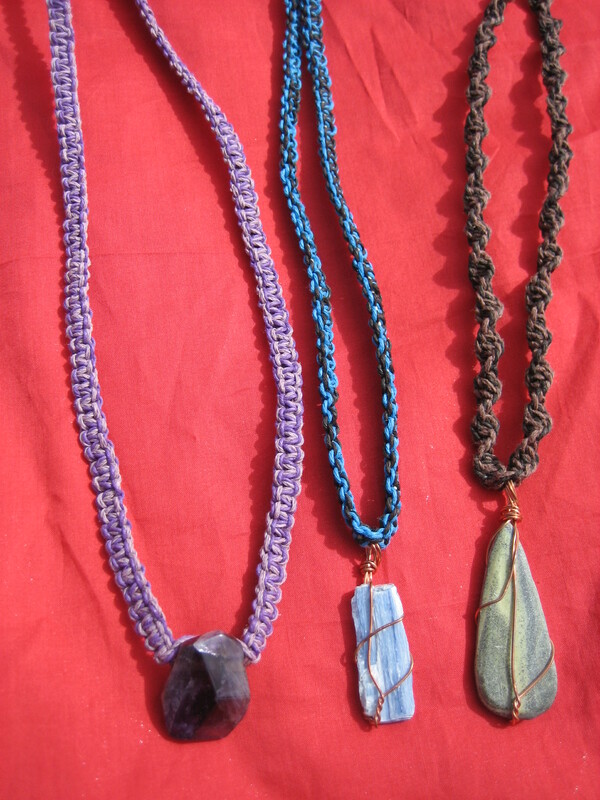 Trinket necklaces. I have lots of other necklaces with trinkets, and I have a lot more trinket pendants and beads I could use for custom pieces. 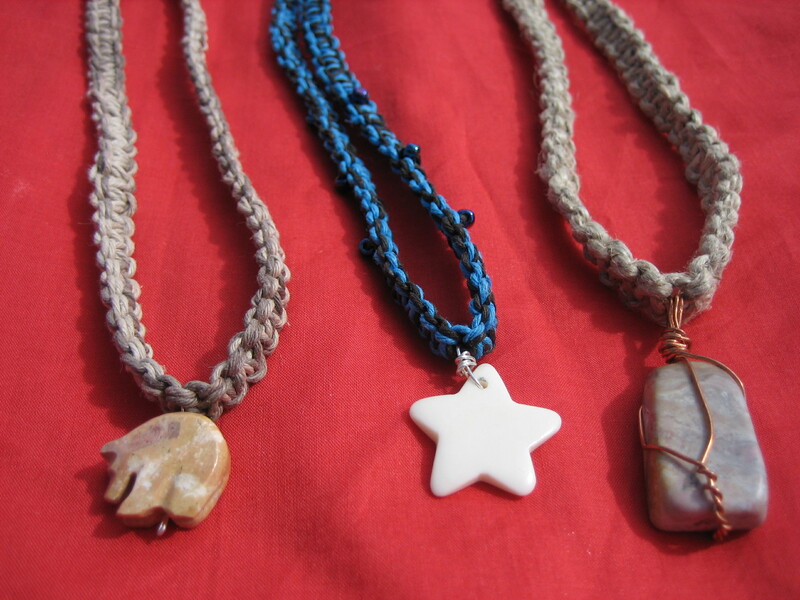 From left to right: stone bear, bone star, polished rock necklaces. These are very nice! What would you like for the two little books, and the one longer kyanite? Thanks, Sassy! I’ll send you an email with price information.